If the sight of Woods, Mcllroy, Westwood and company vying for the green blazer at this year's US Masters has given you the taste to get out on the green, GPS experts Garmin recently unleashed its Approach S2 golf watch which takes some of the thinking time out of your round so you can pick out the right clubs, concentrate on your form and not be one of those people who holds up play. 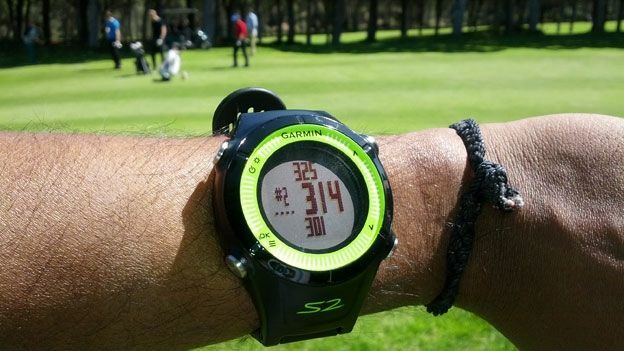 Whisked away to the sunny shores of Costa Brava in Spain, T3 were fortunate enough to see the Garmin Approach S2 GPS golf watch in action to find out if the sporty timepiece makes a good first impression. Modelledclosely on the look of Garmin's Forerunner sport watch range the S2 hosts a 1.0-inch Mono LCD display and uses the same bold, clean interface as Forerunner watches that can be navigated around using the four physical buttons. Weighing in at just52g, the ApproachS2 is slightly lighter than the Approach S3(59g) which means the watch is by no means bulky around the wrist and shouldn't get in the way of your swing. Available in bright white and a more low key black shade the watch is also waterproof up to 10 metresmaking it primed for a rainy round or reaching into a water hazard to retrieve your ball. At the heart of the S2 is the GPS receiver and the storage of data for over 30,000 courses across the world, so that as soon as you step on the course you can see the distance from the front, middle and the top of green which adjusts as you get closer to putting territory. Uniquely, the S2 Approach can measure dogleg distances to see around those tricky corners of the green, giving you a much more accurate way of sizing up the challenge that lies ahead of you. Updates are offered four times and are for and come free of charge for life which means the database continues to grow and boasts more course information than rival wrist-worn devices like the Motorola MOTOACTV Golf Edition watch. Distance measurements aside, you can keep track of the score for a single player with digital scorecards that can then be saved, downloaded and printed out. An Odometer much like a pedometer will measure how far you've walked on and off the course. You can expect around 8 hours of battery life which should safely get you through a single round before having to clip it back into its charging cradle. At £209 the S2 Approach is around £40 cheaper than the Garmin Approach S3and does lack the touchscreen interface and the Green View mode which lets you see a graphical view of the course and adjust the flag according to the day's pin placement. In our brief time with the S2, the GPS receiver was swift in recognizing our location and even for golf novices the information displayed was easy enough to get to grips with. While not as sleek looking as the ApproachS3, a decent sized display and comfortable strap also make it more than acceptable to wear as an everyday watch a touted three week battery life. Invariably the question golfers will be asking is whether a dedicated device like the Approach S2 is better value than downloading a golf app to a smartphone that can offer similar features. The obvious advantage is that you won't have the GPS draining battery life on your phone and when time is a premium on a busy course the Approach S2 goes about its job in a very simple and stress-free way quickly delivering the key information golfers of all levels will surely appreciate. We'll be spending some more time with the Garmin Approach S2 in the near future so stay tuned to T3.com for a full review to see if it is worth the investment.